Heroes Community - Let's talk about Maths!!! Heroes Community > Tavern of the Rising Sun > Thread: Let's talk about Maths!!! The solution is 7, as it was already said. I'll try to prove it mathematically. Let's say that there was x chickens at the beginning. The first customer took chickens. The second one took chickens: there was x minus what the first customer took chickens remaing, and the second took half of that number plus half a chicken. The third one took (the logic behind this is the same as for the second customer, the only difference is in the number of remaining chickens after the second customer. How about [(0.5 x 2 + 0.5) x 2 + 0.5] x 2 = 7 ? Cuz that's how it went inside my brain. I tried to formally show it with equation But basically it is the same. Not sure how popular this is nowadays, but as a kid it blew my mind. Anyone knows the answer? Edited by OhforfSake at 20:34, 06 Apr 2016. The blue/orange triangle does not continue onto the orange/blue triangle (different angles) though it looks like it at first glance. Try e.g. to take the lower picture and count 5 to the right for the orange triangle and see it goes 2 up, do the same for the blue triangle and see it only goes almost 2 up. Edit: Or in other words, they're not triangles, they're squares. Edited by Nitramar at 21:06, 10 Apr 2016. The total area of all shapes is A = 14 + 8*3/2 + 5*2/2 = 14 + 12 + 5 = 31. When assembled like in the above figure, they seem to form a triangle of area 13*5/2 = 32.5. However, actually the different angles of the blue and orange triangles give us two possibilities to only "approximate" this triangle with a "near-triangle" whose "near-hypotenuse" is formed by connecting the hypotenuses of the blue and orange triangles to create a trianglar arc. In the figre, the picture at the top represents situation (1) and the picture at the bottom represents situation (2). 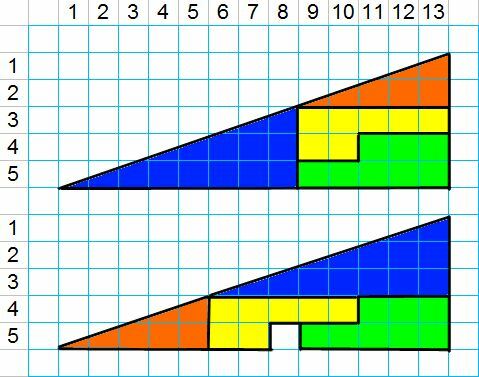 The blue triangle's angle is atan(3/8) and the orange one's is atan(2/5). Now, it is known that atan(x) + atan(y) = atan((x + y) / (1 - xy)) [mod pi]. Now, observe that 2117 = 1^2 + 46^2. We also know that if x = atan(a/b) then tan(x) = a/b, where x is the angle of a right triangle with height a and width b.
, which indeed exactly accounts for the missing square. Haven't had one of these in a while. Suppose your uncle likes to randomly give you $10. The probability of receiving $10 from your uncle on any given day is 3%, or roughly once a month. He gives you $10 today: Wednesday, March 9th, 2016. What is the most likely day (if any) for the next $10 gift from your uncle? Here's mine explanation for that problem for people who are fond of probability trees. Can someone please help me with a mathematical translation of this? The link is broken and I'm in the middle of an argument with someone who says, like Elvin, that the chance is equal for each day because it's established from the premise. I guess it lies in the word "Next", if the question was only what is the most likely day you'll receive 10$ then every day would be equal likely (except for today I guess), but the question is specific for the next time you receive the money. Simplified it's like asking on what coin throw do you have the best chance of the next throw being a specific outcome. Second throw = 50% * 50% (because you have to take into account the first throw failed, hence the "next" part). Third throw = 50% * 50% * 50% etc. etc. In other words, it's the next day. The "next" seems to me to be inconsequential, the problem would've fell under Poisson distribution regardless. The fact that the event happened once doesn't seem relevant either. Basically, as I understand it, if you have a fixed percentage for an event to happen for a number of times in an interval, Poisson distribution would apply, and the biggest chance for it to happen would be on the first try. If the problem would've read: "There's a 3% chance an uncle gives his nephew 10$ on any day of the month, when is that most likely to happen?" - it would've been the same thing. What intrigues me is if the experiment would be repeated ad infinitum, would the statistical results correlate to what Poisson distribution suggests? I have this nagging feeling that statistically the events would be clustered more nearing the middle of the interval, but I might be thinking of binominal distribution. Edited by OhforfSake at 13:18, 21 Feb 2017. 1) At what throw is it most likely you'd get heads? 2) At what throw is it most likely you'd first get heads? Edit: To specify, I would like you to do it and not only to think about it. I have given this some more thoughts btw. and I came to the conclusion the method is also important. Imagine in stead of looking over an infinite span we only look over e.g. one month (30 tries) and all we're told is that we're certain of at least one success within this month (so this mean if there has been no success for the first 29 tries, try nr. 30 is a guaranteed success) and all days will be treated equally, possibly except the final day if you haven't had any success so far. Under these circumstances I can think up of two different methods where in one case the highest chance of first success is the following day and another method where every day has the same chance of equal success despite all days being treated identically possibly except the final day. The first method is the same as the original, here the uncle throws a 30 sided die once a day and if it lands on e.g. 1 it is a success, and if you haven't had any success by the final day he doesn't throw the die, but give you the 10$. The second method he throws a 30 sided die the first day and whatever it lands on is the day you get your 10$. My opinion is that with the first method the following day is always the best chance of the next time you get the money, but with the second method there is no difference, despite both methods treats every day fairly (with the possible exception of the final day). That's because the nature of the mechanic involved changes. Let's say you have a bowl filled with 30 balls, 1 of which is green, the rest are red. In the first case, you randomly draw one ball out of the bowl; you have about a 3% chance to draw the green one, about 97% chance to draw a red one. Then you put the ball you drew back into the bowl and make another draw the next day. On the first day, you have a 3% (well, 1/30 to be precise, i.e. 3.33%) chance to draw the green one and 97% (29/30 to be precise, i.e. 96.67%) to draw a red one. The second day, however, only 29 balls remain. If the green one is still in the bowl, you then have 1/29 chance to draw it, i.e. 3.45%. This requires a red ball to have been drawn on the first day, however, so the total odds to draw the green ball on the second day is 29/30 * 1/29 = 1/30 = 3.33%. Drawing it on the third day has a chance of 29/30 * 28/29 * 1/28 = 1/30 = 3.33%. In other words, every day has equal chance then. In the first case, of putting the ball back, the chance for the next one steadily decreased with increasing number of days. Edited by AlHazin at 13:21, 10 Mar 2017. OK I need some help with lug nuts in general. Car constructors usually give you a point to attain in order to consider the lug nut torqued. So when they give you 150 Nm, which equals 110 foot pounds. Concretely, what does that mean? How much do you have to torque to know you have reached the 110 foot pounds? Edited by Maurice at 14:29, 10 Mar 2017. ... which equals 110 foot pounds. Concretely, what does that mean? It means some countries finally need to make the switch to the international standard of measurements . Edit: Based on what I read, it's the amount of force you need to apply to move th torque when you apply that force at the end of the torque. In Newton-Meter it means the momentum/weight (in Newton) you need to apply to the end of a 1-meter length torque. In foot pound, it seems to be the amount of pounds you have to apply to the end of a 1-foot long torque. I see. So if you use a wrench of 50 cm you'll have to apply twice the force you would on a 1 m wrench in order to torque it the same amount. 2Nm so. Thanks.